In general, pomegranates are thought of as helping the body to detox – in fact, they are said to have more natural antioxidants than any other type of fruit, and are stuffed with polyphenols, tannins and other naturally occurring chemicals that help to boost health. Pomegranates help reduce harmful biological functions while boosting vitamin intake and promoting good health. Try a pomegranate for breakfast, or have a glass of pomegranate juice alongside your morning toast or bagel. Pomegranates are said to reduce the risk of heart disease, and early research has shown that they reduce the occurrence of various underlying biological functions that cause heart trouble – they help to balance the types of cholesterol found in the body, and also increase the speed at which potentially troublesome blockages are naturally resolved. Pomegranates are also said to have a role in fighting various forms of cancer, including prostate cancer, lung cancer and breast cancer, because of their natural antioxidant properties. However, the scientific studies into the benefits of pomegranates for cancer patients are in their infancy, and you should ask your doctor for more information and the latest research. The high fibre and vitamin content of pomegranates may help you lose weight and keep fit. Obviously a committed dieter will need to make other changes to their eating pattern other than including pomegranates, but the fruits can be a low-calorie mood booster that make you feel much healthier. Some research suggests that pomegranates can reduce the risk of Alzheimer’s, and slow the disease’s progression. Pomegranates may help your body resist infections such as the common cold, as they’re full of vitamins. Try taking some pomegranate tea during the cold season to ward off and reduce sniffles, sore throats and blocked noses. Depression may be improved with pomegranates and pomegranate products – research in this area is limited, but the fruits are so beautiful and good to eat that they’re bound to boost anyone’s mood. Pomegranates are said to be particularly helpful in helping women who are going through the menopause to overcome depression. There is also some evidence that pomegranates may improve bone density, and that their consumption guards against osteoporosis and other skeletal disorders. Pomegranates may also be able to prevent tooth decay, as it naturally discourages plaque. You shouldn’t abandon your usual teeth-cleaning routine, but instead add some pomegranates into your regular diet. 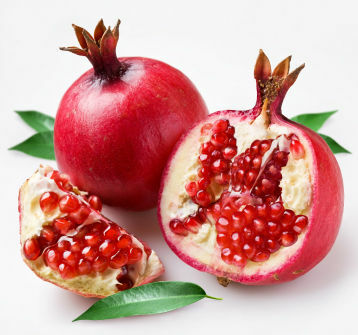 If you’re interested in incorporating pomegranates into your diet, then pomegranates are found in Turkish, Georgian, Greek and Jewish cuisines, as well as other food cultures around the Middle East – reading recipes from these areas will give you some great ideas to boost your pomegranate consumption. Pomegranates are also delicious in smoothies.